Iceland Car Hire - What is SAAP? Do I Need It? Iceland Car Hire - What is SAAP? Do I need to take out additional insurance for sand and ash? Iceland is a beautiful country with a fascinating landscape. To enjoy all its stunning features - waterfalls, geysers, volcanoes and lagoons - car hire is essential. But this unique volcanic landscape with its rough roads can also prove hazardous to cars. SAAP is Sand and Ash Protection. Iceland, particularly in the South, is prone to sand and ash storms which can cause major damage to the exterior of the car. If you do not have insurance against this you could face a very large bill. See our chart on the right to work out your options for sand and ash protection as well as cover for damage by gravel. These policies can be purchased through your car hire company. Gravel protection policies can also be bought if necessary. Many of the more rural roads in Iceland have a gravel surface and pieces can often fly up and cause chips and dents to the paintwork of the car. Gravel Protection is commonly a separate product from the Sand and Ash cover - if it is excluded from the CDW - so check any car hire to see whether you have cover or not. Through our sister site Clarify Car Hire we take the stress out of comparing car hire in Iceland. Using our special filter, available on the top left when you run a car hire quote in Iceland, you can select to compare car hire in Iceland including sand, ash and gravel cover giving you a true idea of what you will be paying. Alternatively, Carhireexcess.com and Insurance4CarHire both offer an independent policy - available through the MoneyMaxim Car Hire Excess Comparion Service - which will reimburse you for the cost of damage by volcanic ash which falls outside of your CDW policy. If gravel damage is not excluded from your CDW then this policy will reimburse you for the excess you are liable for. Policy limits apply. 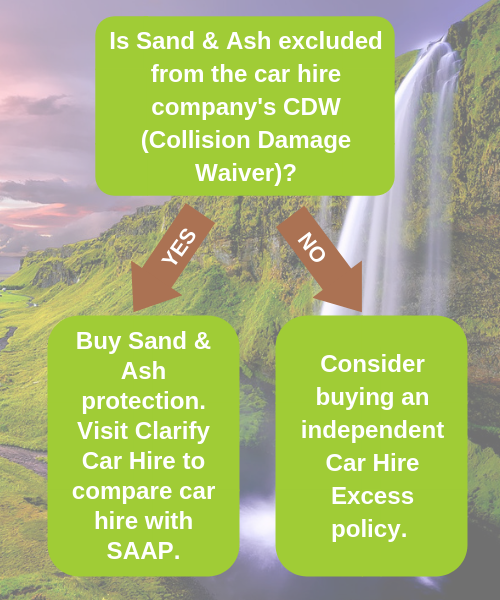 If your Collision Damage Waiver with your hire car includes cover for sand, ash and gravel damage, then you will only be liable for the excess on this damage. Any of the policies via the MoneyMaxim Excess Insurance comparison service will cover you for this excess on a reimbursement basis. Any questions? Our customer service team here at MoneyMaxim are ready to answer any of your questions regarding car hire in Iceland. Contact us via the webchat online or by call us on 0800 520 0699.